Experiencing Capri with my husband for the first time. Great expectations. Weather looking questionable…will it rain or shine? The days have been filled with non-stop dashing, bustling, climbing, darting, hastening and scurrying through the gritty grandeur of Naples. We are ready for a warm retreat. 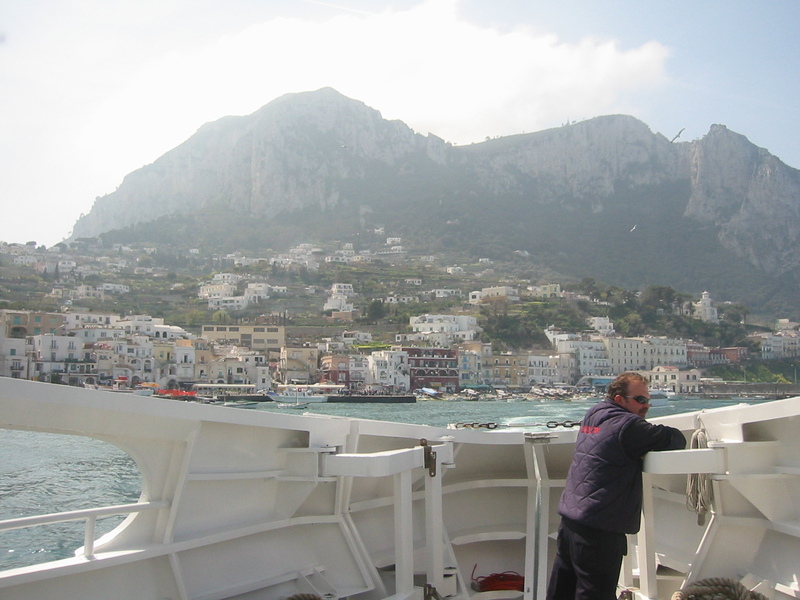 We dock with the ferry, gather our backpacks, and wind our way through Capri’s Marina Grande. 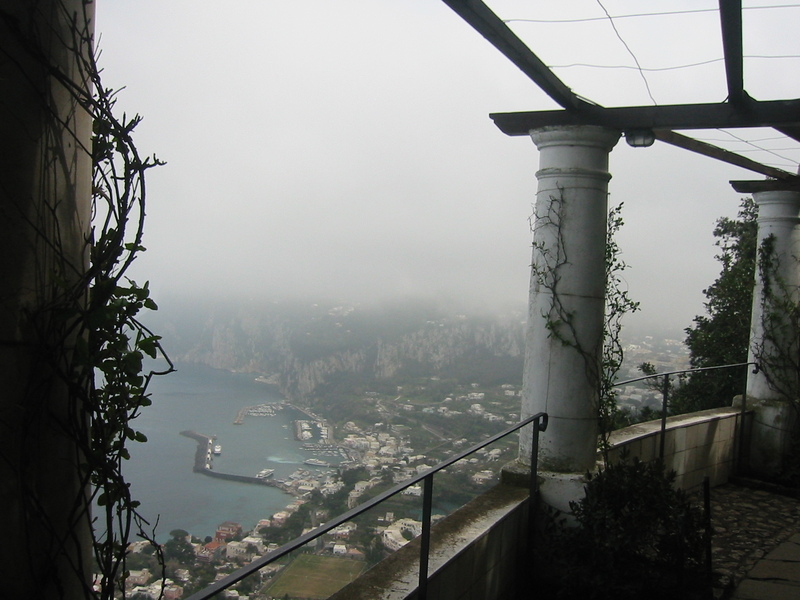 All is white everywhere…white buildings, white clothing, even a white sky….but the sky over Capri should be blue! As we climb the steps toward the village, I watch the wind gently tease the little white sails on the harbor boats. Small whitecaps begin to form on the green-blue sea. We check our map to mark our route, then cram ourselves onto a tiny overcrowded bus that will take us up, up the winding little back streets to Anacapri, the smaller of the islands two main villages. After getting off the bus, we begin our fifteen minute hike through orchards and lemon groves. As we pass a spattering of small country homes, our pathway brings us to our lodgings for the night. The building was large and spacious, with rooms off the hallway. All was quiet as we seemed to be the only ones there. The clouds begin to hem us in like the batting of a quilt. We awake the next morning to the sound of wind blowing against the glass. Stepping outside, my heart sinks. No warm exotic weather for us! The wind has changed from playful to billowing. We decide to brave the storm and walk down the winding pathway to the little village. The rain begins its banter, giving expression to the swirling wind. My cheeks feel its cool sweep as I lean into it, determined to make our destination. 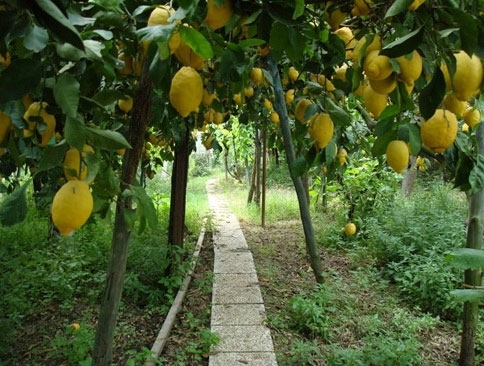 Finding shelter under the lemon trees was sweet! Passing through an orchard we find ourselves in the open, taking in the tumultuous sea. The thick-set heather and myrtle was all around us, frisking in the wind along the open terrain, holding tightly onto their plot of earth like rocks. Cypress trees sway and dip. My hair quickly morphs into a tangled mess. We dry off with warm showers, make our prosciutto, cheese and gherkin sandwiches, and find hot chocolate from the kitchen. Tucking ourselves into our magnificent bed with airy white comforters, we begin to cherish the simplicity of the day. It was not what we had hoped for, but better than we could have imagined. 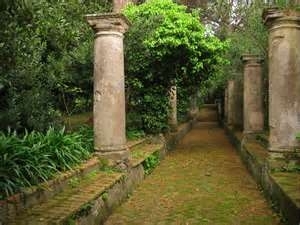 Our sandwiches were the best, the hot chocolate delightful, and our books kept us engaged with some of Capri’s most illustrious former residents–the generous Axel Munthe (click for my article on this amazing man) and the unforgettable Caesars of the early Roman empire. In the land where the pale citrons grow. Please like and share this article if you have enjoyed it. 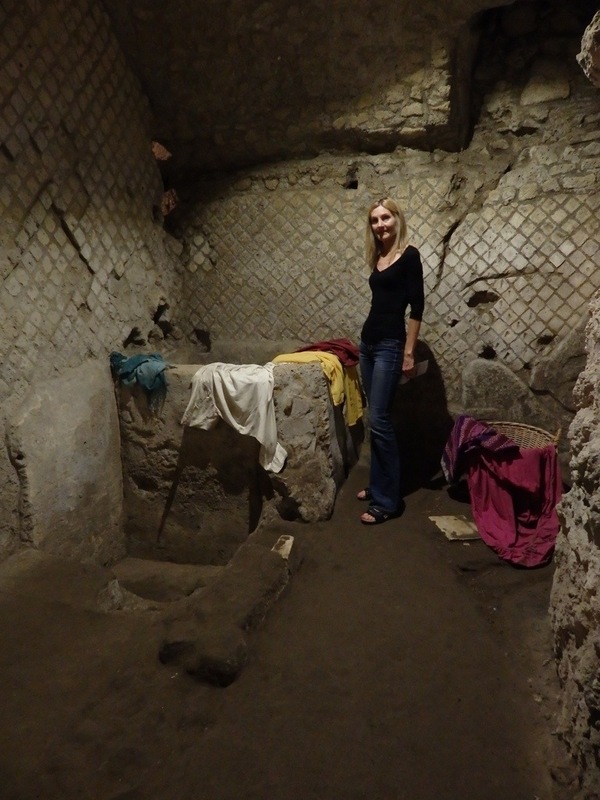 I would love to have you follow me as I share my discoveries of timeless Italy! 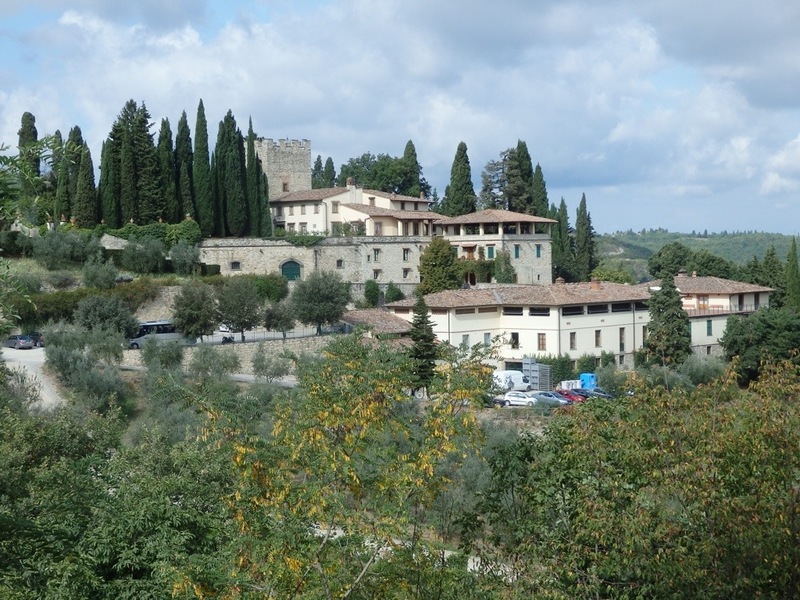 Clouds rolled in on the morning of our wine tour of the Castello di Verrazzano Winery in Chianti. But no matter. After a sumptuous breakfast of fresh-baked coffee cakes, slabs of white cheese, meats, croissants and tasty jams in the castle, everyone gathered into a group on the spacious front lawn. The Castle rose elegantly above us, adorned by lush late-Renaissance gardens and an elegant fountain. 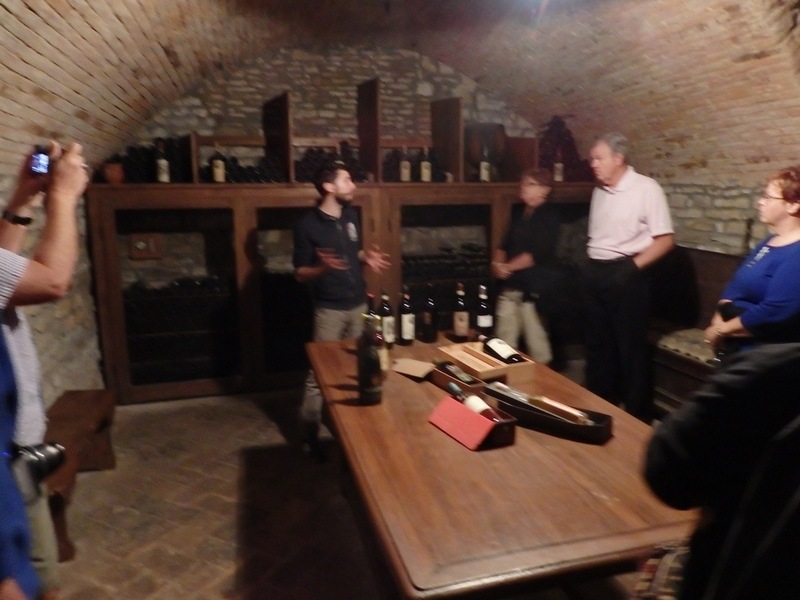 We are greeted by Matteo, our wine guide for the tour, personally appointed by ‘Captain Verrazzano.’ (Giovanni da Verrazzano was an early explorer and merchant born in the castle and covered in my previous post, Tuscany’s Castle Winery Leaves a Dashing Legacy). Matteo instantly won our attention and affection by his approachable, enthusiastic and humorous personality. Brimming full of pertinent information about the Verrazzano Estate, as well as the intriguing history surrounding the family, he kept us greatly entertained. 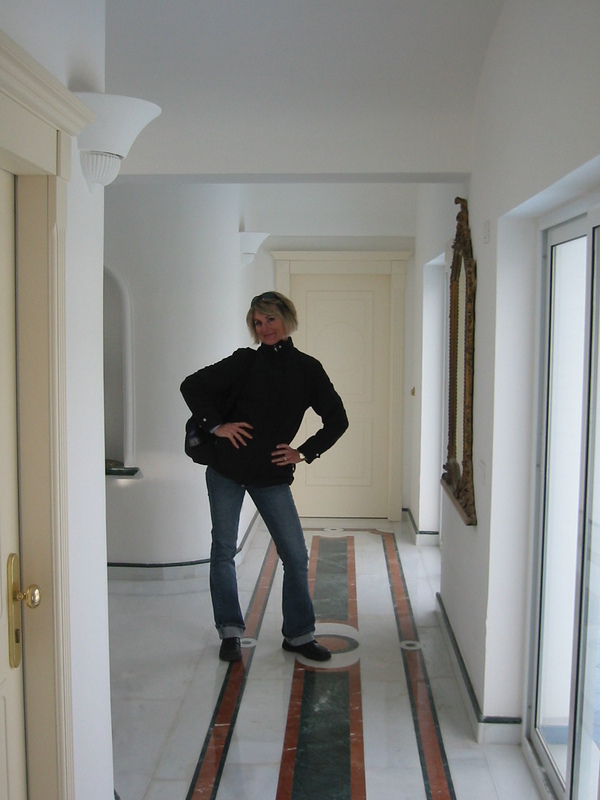 We walked down mysterious corridors….. 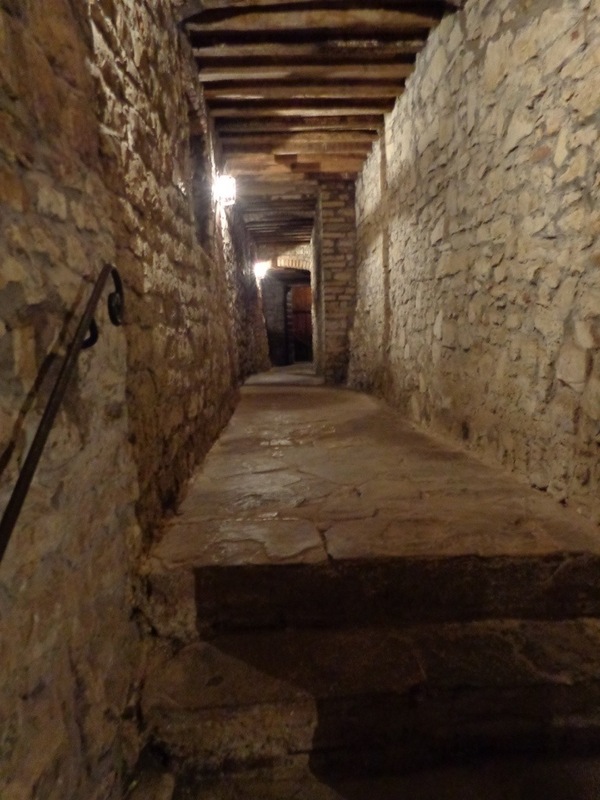 The castle cellar was dungeon-like with small rooms off the passageway. 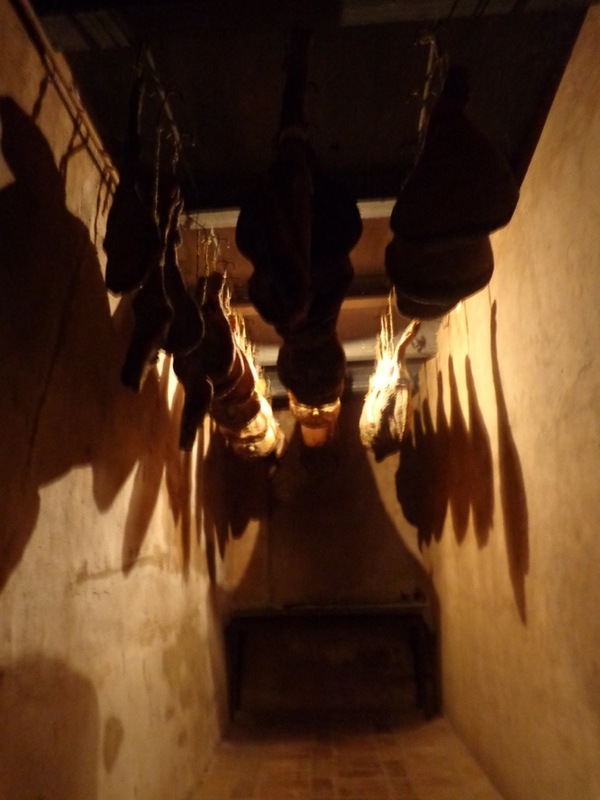 I saw boar’s legs of prosciutto hanging from the ceiling as I looked through the bars of a door. In another were huge terracotta amphorae full of Verrazzano extra-virgin olive oil from olives grown on the estate. Another product of the castle, miele (honey), is produced from beehives placed on the estate, gathered and sold in jars. 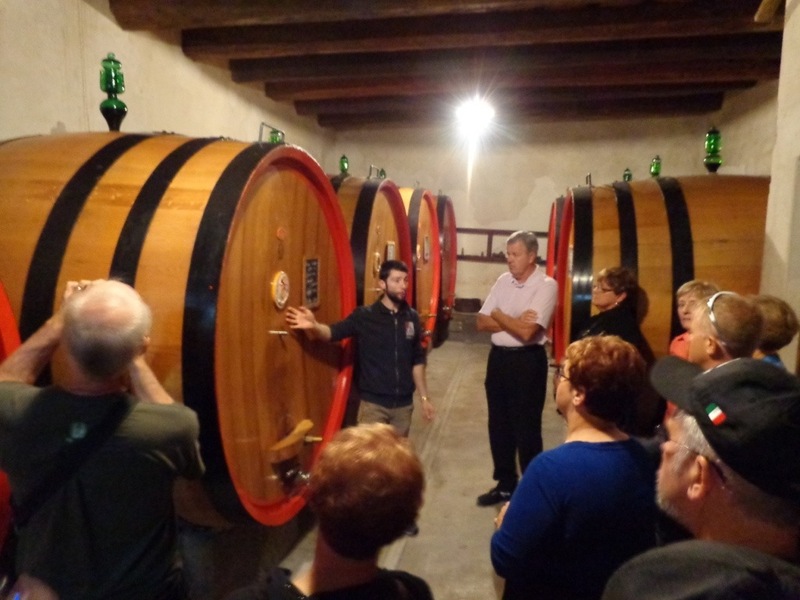 Vinegar, also, is made from the natural acetic fermentation of Verrazzano wines, then aged in oak barrels for three months. 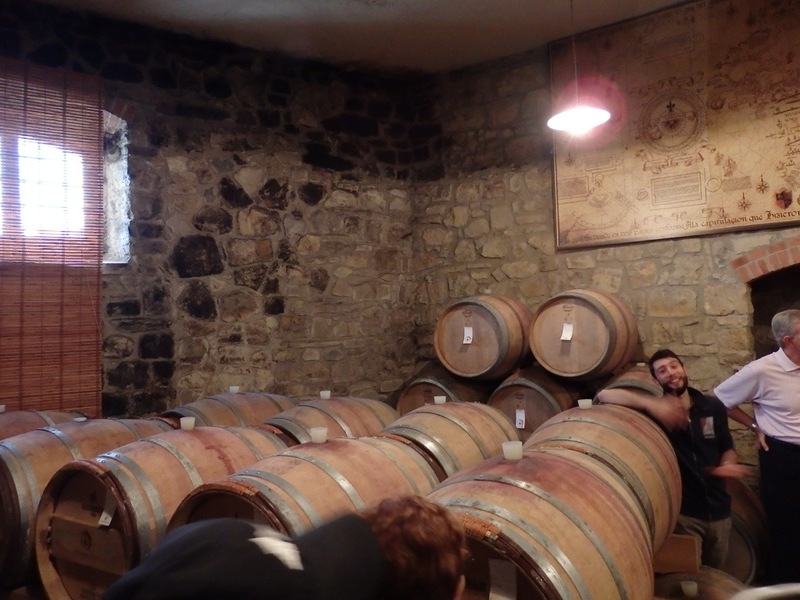 The barrel room where the exquisite Verrazzano wines age to perfection. 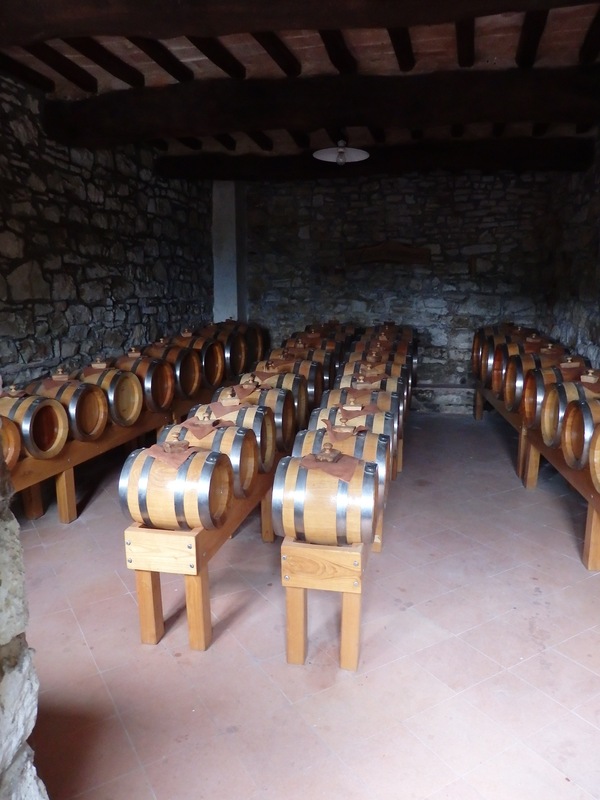 Verrazzano Balsamic Vinegar is aged in these tiny barrels for up to twelve years. It is made by slow fermentation and acidification of the Trebbiano grape, cooked over a fire without any other substance added. We have a sampling and it is wonderful. It is thick and syrupy, yet elegantly flavored and not piercing like some I have bought in the stores back home. The texture is velvety and it is aromatically infused from the several kinds of wood from the barrels. 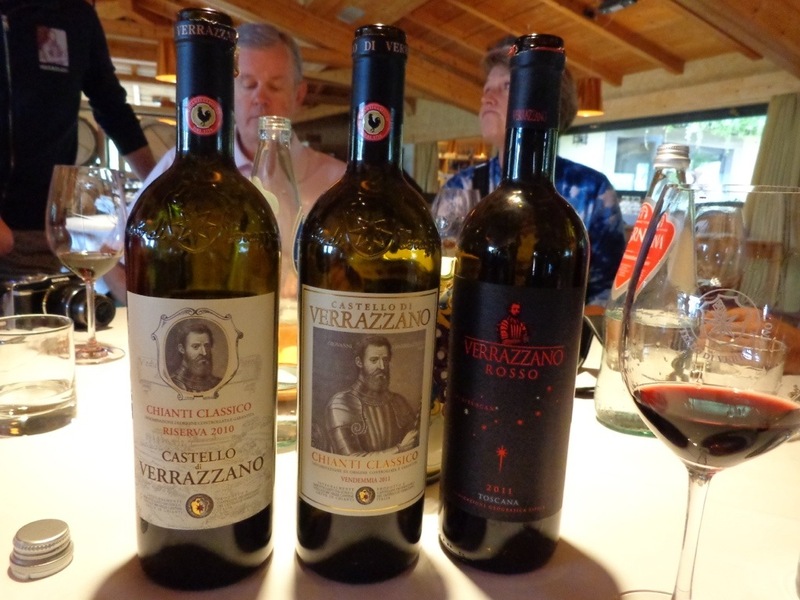 Castello di Verrazzano makes several wines from the grapes grown on their estate. 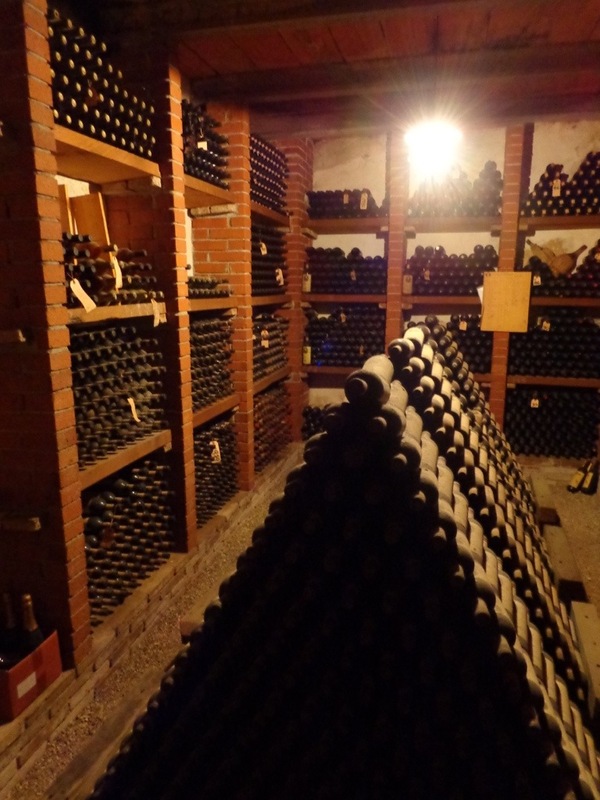 Vin Santo, the ‘Holy Wine,’ is made from the Trebbiano and Malvasia grapes, gently mashed after a long drying. Here at the estate, the strands of white grapes are hung up to dry. As they dehydrate, the sugar becomes more concentrated and perfect for the dessert wine. Donna Clara is another white wine, made from Trebbiano, Toscano, and Gewurztraminer grapes. This aromatic, balanced and medium-bodied wine is pale yellow. Bottiglia Particolare, Sassello and of course, Chianti Riserva are the Verrazzano Estates famous red wines made of Sangiovese blends. Grappa di Verrazzano is produced by distillation of steam with the discontinuous method of fresh grapes of the Chianti Classico vineyards of the Castle. 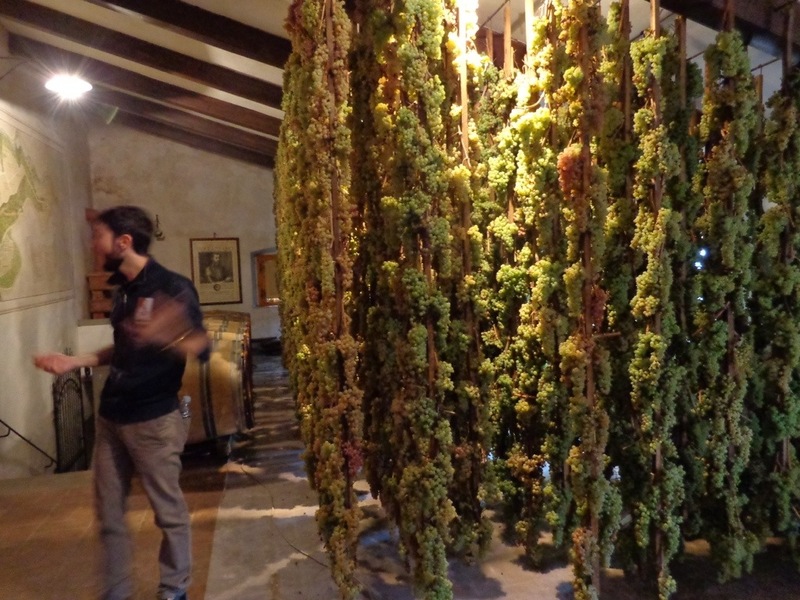 Trebbiano and Malvasia grapes hanging to dry for Vin Santo wine. Afterward, we wind our way back outside of the castle and over to the big spacious tasting room which is held in a part of their restaurant. Some of the people sitting at my table examine wine just poured as Matteo describes the varietal. Plates of bread lavishly spread with Castello di Verrazzano olive oil and sprinkled with sea salt arrived as an accompaniment. It disappeared in no time, as did the wine! We wound up our tour and raised a glass to each other’s most excellent health for the coming year. Castello di Verrazzano has left a memory of historical intrigue, medieval wonder, the beauty of vineyards and rolling hills with castle tops, and some delicious wine primed to perfection over the centuries. Salute! 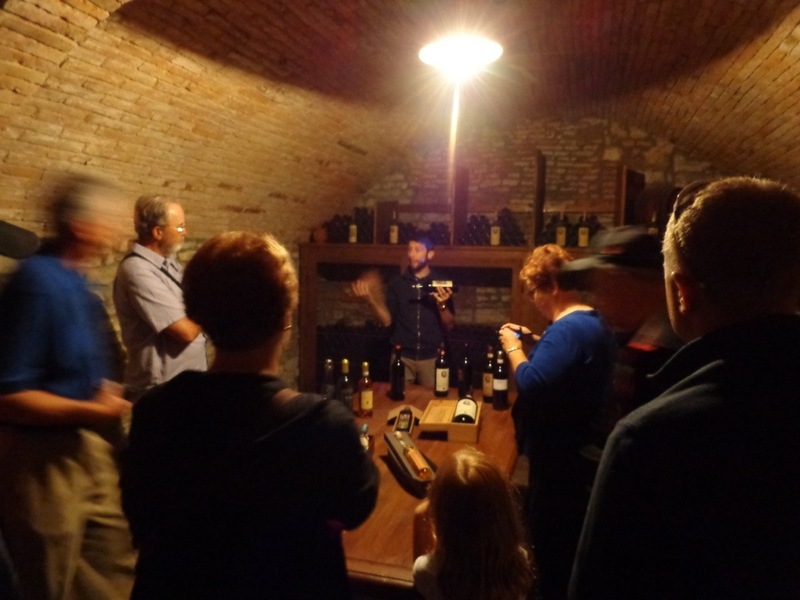 Have you had the pleasure of touring a castle winery? 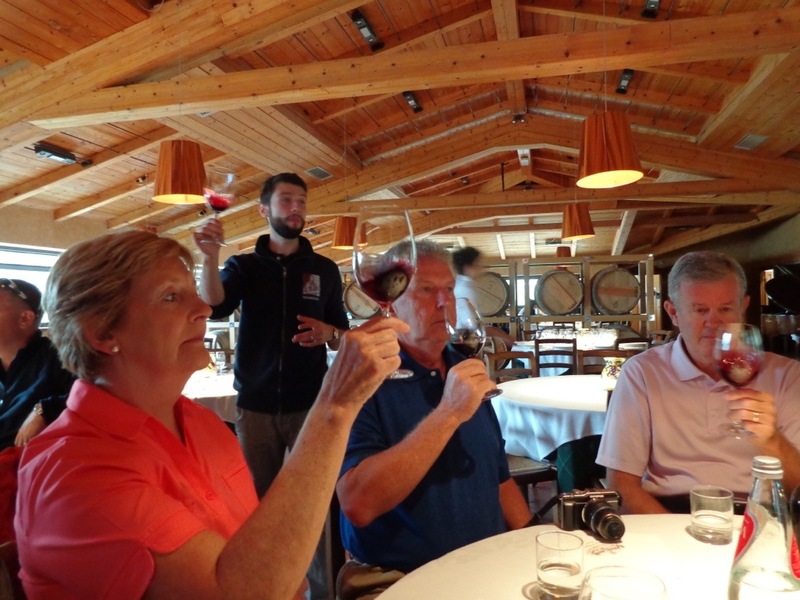 What is your favorite memory about a winery tour? I’d love to hear your thoughts so please feel free to leave a comment below. Working my way down the vibrant street markets of Napoli just recently was mind-boggling. Scooters roared and car horns impatiently pierced the air. Throngs of people clogged the medieval arteries of the city, pressed in to look over and purchase their products from busy shopkeepers. Store windows behind them displayed rows of hanging tripe, lamb, and prosciutto, as well as mouth-watering bakery items and slices of pizza for a euro. In a crowded intersection where two streets meet is Piazza San Gaetano. It was here that I found something I least expected in the heart of this bazaar world. Standing in front of me towered an old basilica. 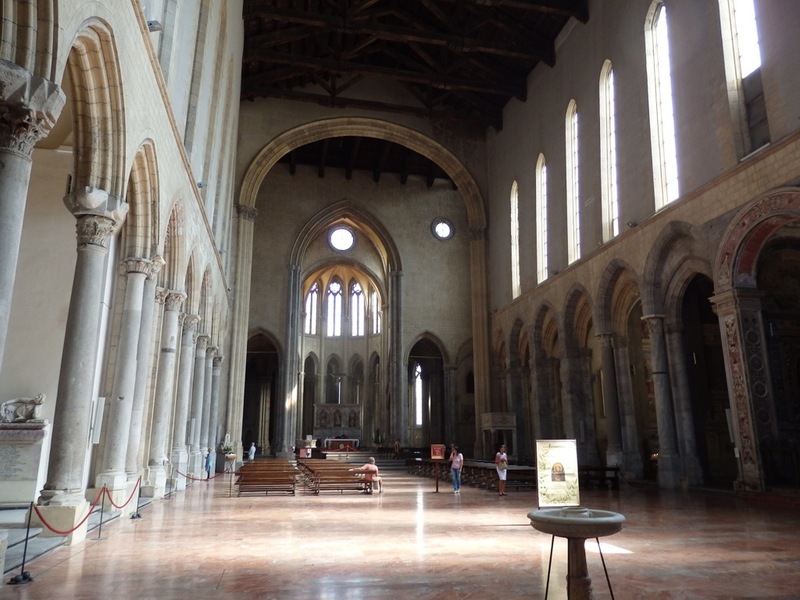 San Lorenzo Maggiore was a sight to behold. 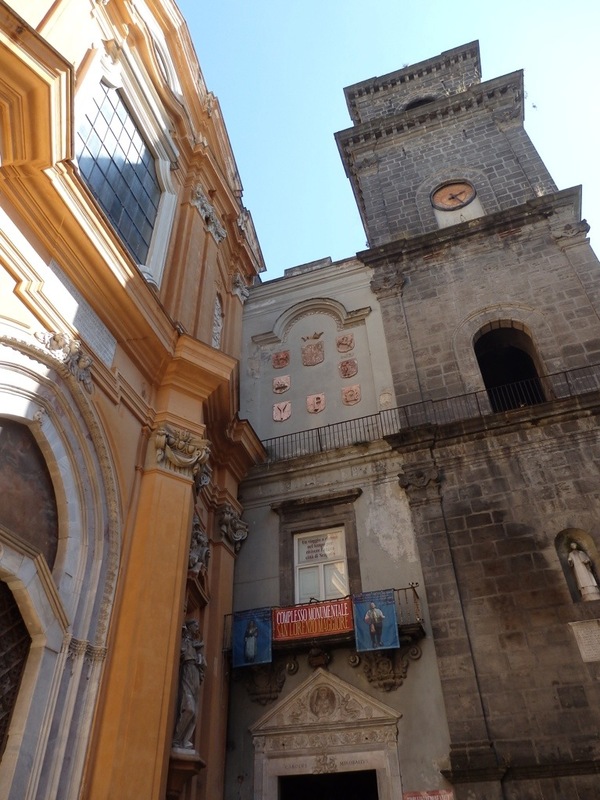 This handsome thirteenth century Gothic church was built on top of a previously existing city hall by the Franciscan order in Naples during the lifetime of its founder, St. Francis of Assisi. Evidentially, Charles I of Anjou decided to build his fortress, Maschio Angioino, where the Franciscans had an existing church. Charles compensated them by providing this site for the present church of San Lorenzo Maggiore. What is surprising and not noticeable until you enter the building is that it is also a monastery as well as a museum. 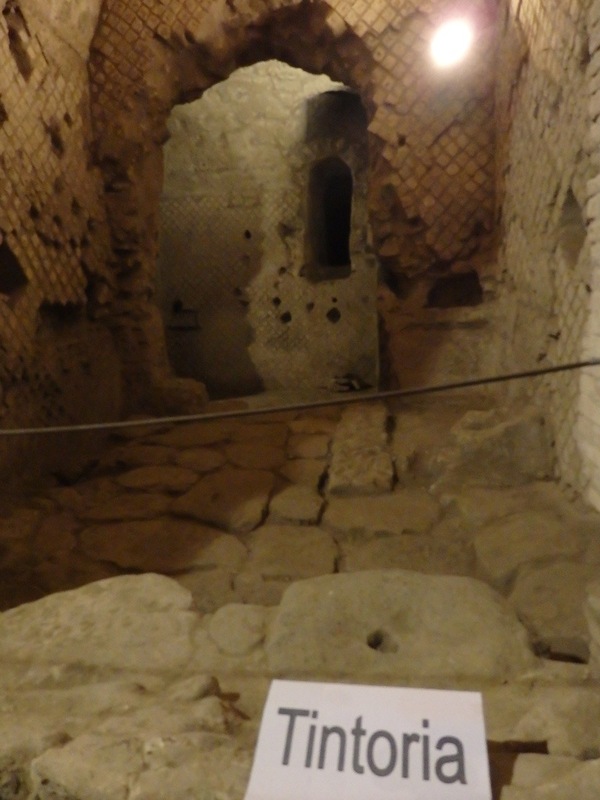 The museum takes up three floors and gives a history of the area around San Lorenzo beginning with classical archaeology. 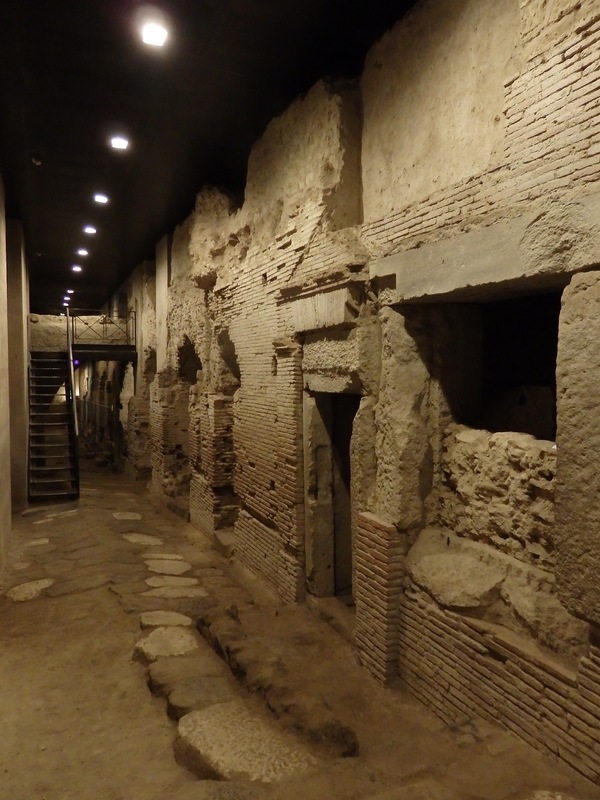 But the most astonishing part of all are the remains of an original Greco-Roman market that was excavated over a period of 25 years and has been opened to the public since 1992. 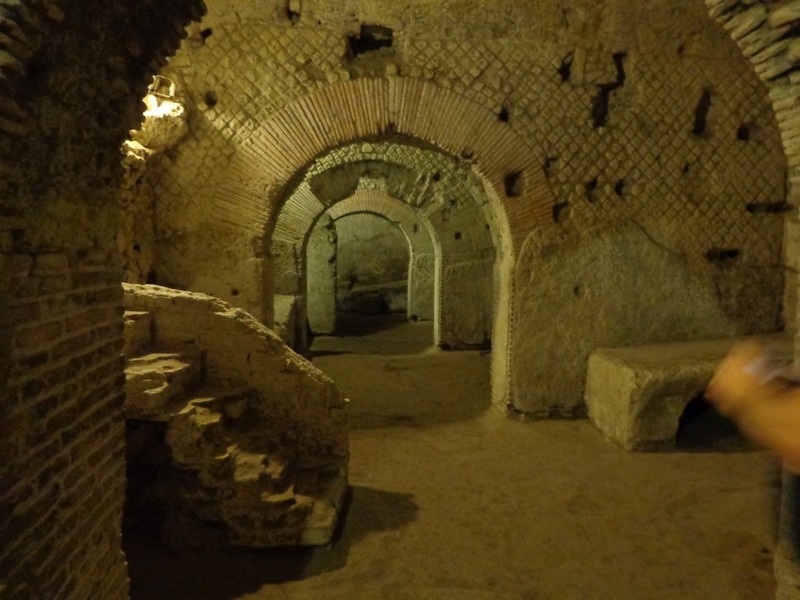 Located in the middle of the historical center that began as the Greek-Roman city of Neapolis (new city), this market is one of only a couple of large-scale Greek-Roman sites excavated in the downtown area. For those of you who love ancient Rome, you won’t want to miss this. Very close by is the Napoli Sottoterranea, the Napoli underground which is seen only by tours, but this is not part of San Lorenzo’s underground. The following photos were taken while I explored the area. It truly is a rare experience of stepping back in time, from the old earthy smell to the uneven stone streets and arches. However, it requires patience and some imagination to figure out just what you are looking at. 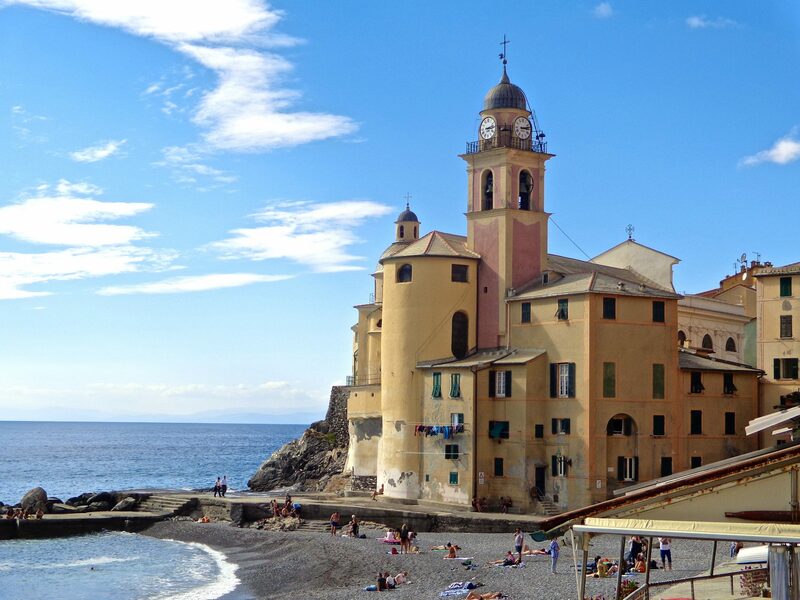 There are no tour guides or audio guides, and most of the information is posted in Italian. What was labeled or partially described I have identified below the photos. Once an outdoor street lining the doorway to small shops. 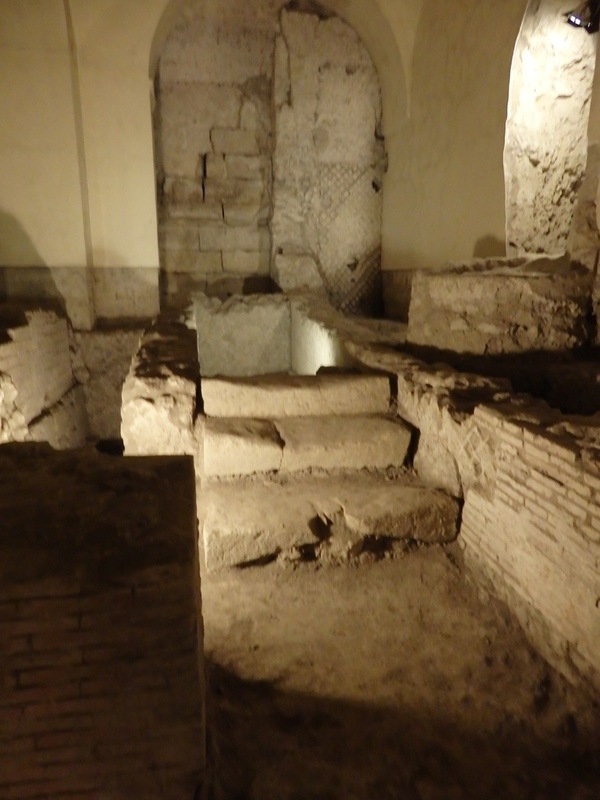 This is the original street level of the ancient city of Neapolis. 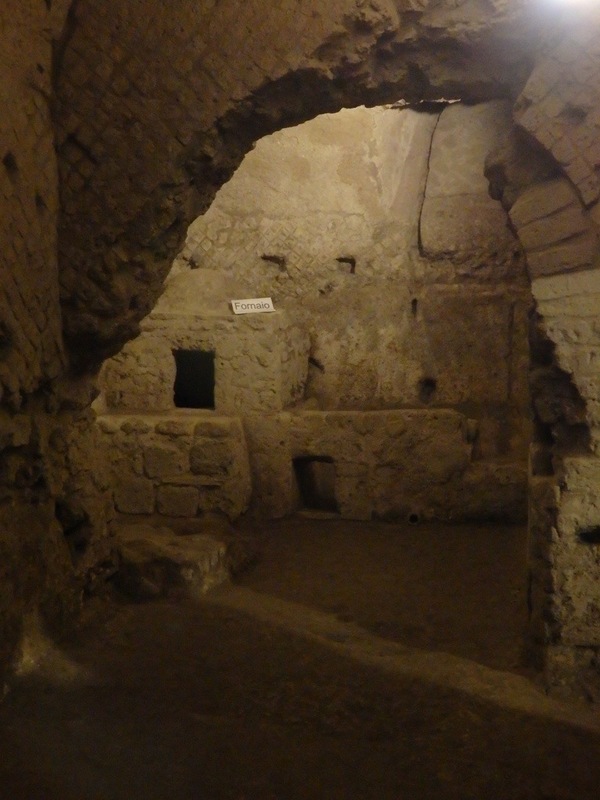 Both a Greek (Agora) and Roman (Macellum) marketplace are the main discoveries that lay below the church. 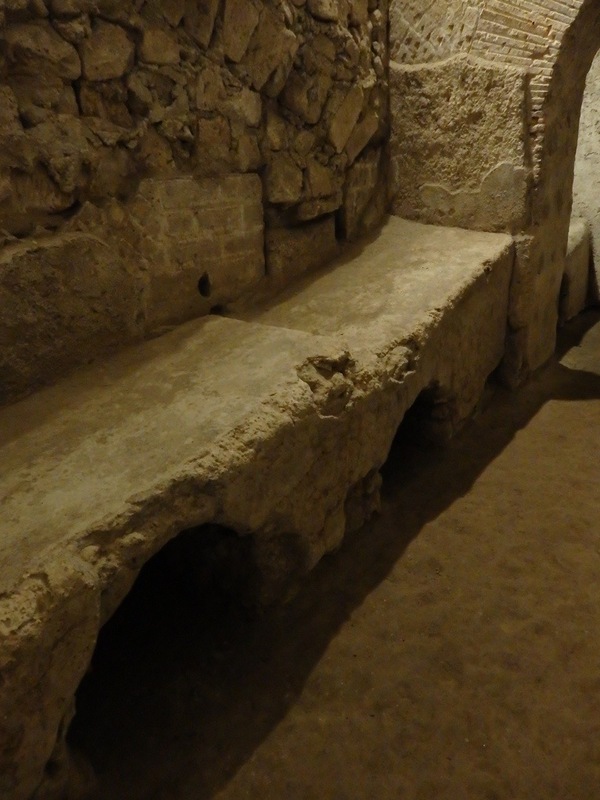 Dating from the sixth to the first century B.C., these streets are perfectly preserved underneath present-day bustling Napoli. Built into layers of volcanic ash and rock called tufa, these ruins are remarkably well-preserved. This covered space was a market area, and shows seven interconnected rooms, with barrel vaults pierced by skylights to draw in air and sunlight. Small shops, called tabernae, line the roads and each one has a skylight of sorts. They would be dank, dark and creepy without them. In these shops it is possible to notice selling counters and wall-niches for the storage and display of various articles. Fascinating…. This is a laundrette where clothes were scrubbed clean. 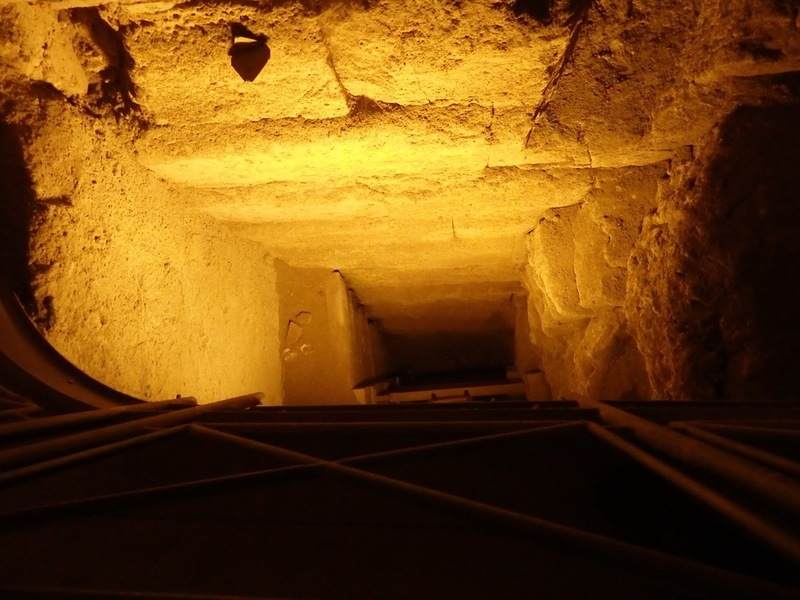 Possibly a well of sorts….I just know it is very deep! A ‘fornaio’ was a bakery. Imagine all the business they must have had! 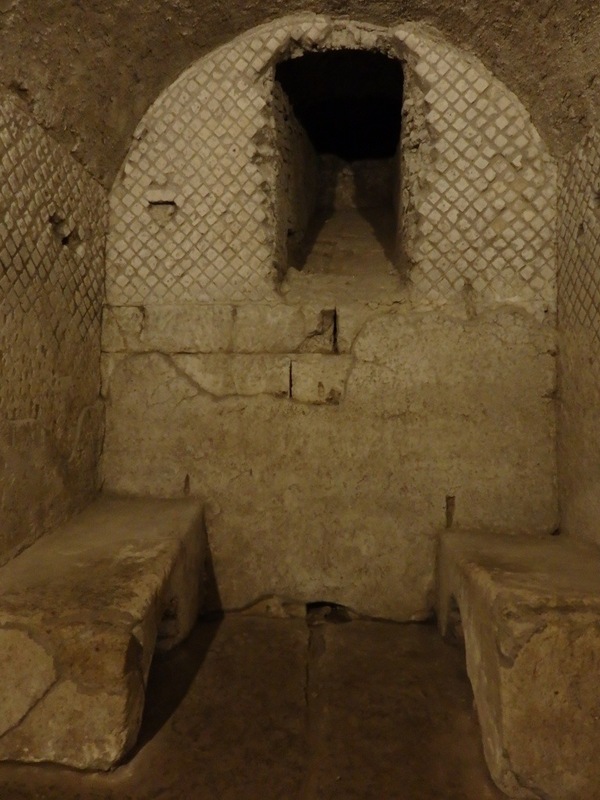 Once you are ready to return to the surface, a stairwell leads you up to a courtyard, which is the 14th-century cloister of the church of San Lorenzo Maggiore. Outside the cloister and back into the streets of Naples, it seems inconceivable that below all the surrounding congestion and frenetic activity lay a still, silent world that once was a bustling marketplace of its own.